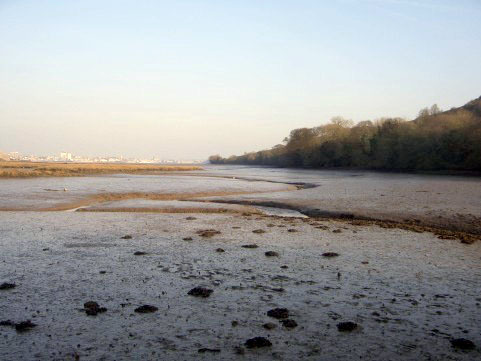 Mud flats are typically found in areas where the tidal waters flow slowly, such as sheltered bays, estuaries, rias and along gently shelving coasts. A mixture of very fine silts from tidal waters and alluvium from rivers dropping their load as they reach the sea, is deposited, causing a build up of mud layers, called mud flats. Mud flats are covered at high tide and exposed as the tide drops. In rias, mud flats are often found in the remains of the valleys that were tributaries to the main submerged river. In such areas, remains of the original watercourses can sometimes be seen as channels carved out of the mud, down which a little fresh waters may be seen flowing at low tide. All mud flats are usually crisscrossed by winding channels that are kept open by tidal action. Unless these channels are fed by active water sources, such as streams and rivers, they will usually dry out at low tide and contain no water. Where the muds are sufficiently stable to support vegetation, salt marsh may form, or in tropical areas, mangrove swamps. In this picture you can see extensive mud flats at low tide. A small channel in the centre of the photograph carries water from a stream toward the main Tamar Estuary. The location of the estuary, and the end of the mud flats, can be identified by the buildings in the distance. These are the dockyards in Plymouth – the river Tamar flows right in front of those buildings. Mud flats are well named. They are muddy, and very flat. 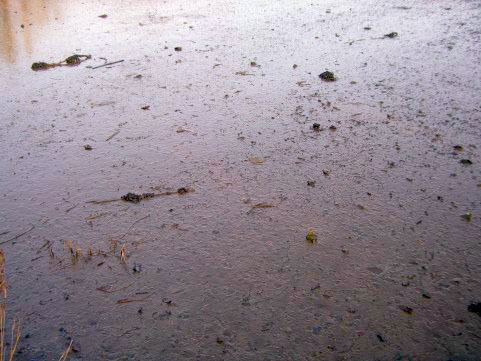 This photograph shows the surface of a typical mud flat. The reflective surface is created by very high water content in very fine slit, producing a mirror like surface. The mud is very unstable and anyone trying to walk on it would sink up to the knees within seconds. Further out into these mud flats you would sink without trace. Despite not being a hazardous environment for humans, the mud is teeming with life and is a popular feeding ground for birds.